Members of the Joseph Spencer Chapter of the National Society Daughters of the American Revolution attended the 117th Ohio Society Daughters of the American Revolution State Conference held in Columbus, Ohio. 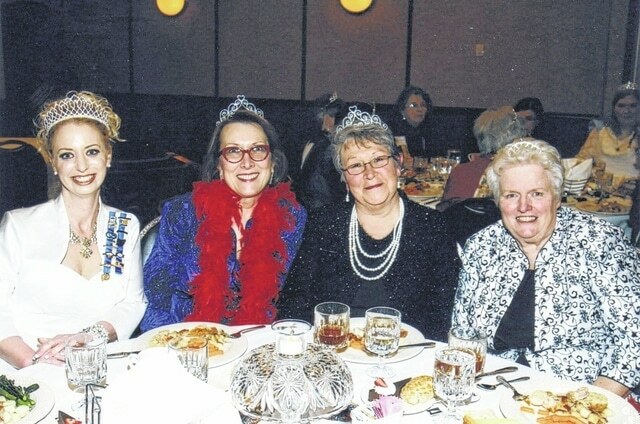 Members of the Joseph Spencer Chapter of the National Society Daughters of the American Revolution attended the 117th Ohio Society Daughters of the American Revolution State Conference held in Columbus, Ohio. Those members in attendance were Chapter Regent, Belinda Bowman-Schaefer, Chapter Vice Regent, Monica Karasek, Chapter Registrar, Joan Phillips, and Corresponding Secretary, Molly Stroud. The aforementioned members attended such events as the National Defense Banquet, Youth Awards Luncheon, Boas and Tiaras Celebration Banquet, and the Memorial Service. Roberta Mershon, Army Nurse Corps, Vietnam War 50th Anniversary Commemoration presented the National Defense Address. The Keynote Speaker of the Boas and Tiaras Celebration Banquet was Denise Van Buren, NSDAR Organizing Secretary General. State Conference guests included Barbara Zink, Kentucky State Regent, Sue Simpson, Louisiana State Regent, Gail Terry, Massachusetts State Regent, Cornelia Olde, New Jersey State Regent, and Barbara Frankenberry, West Virginia State Regent. Special guest presenters were Jason Eller, Chief Development Officer, Tamassee DAR School and Susan Meer, Southwestern District Director, Pennsylvania State Society Daughters of the American Revolution. Special entertainment was provided by Gavin Michael George, a twelve year old concert pianist. He has performed with many orchestras and as a soloist both nationally and internationally. Any woman 18 years or older who can prove lineal, bloodline descent from an ancestor who aided in achieving American independence is eligible to join the DAR. To learn more about the Joseph Spencer Chapter, visit www.rootsweb.ancestry.com/~ohjscdar or visit facebook.com/JosephSpencerChapterNSDAR.